Facebook: making personal websites obsolete? _ Mathias Vestergaard Corp. This was the purpose when I redesigned this website. However, Facebook actually did it before I was ready to launch. 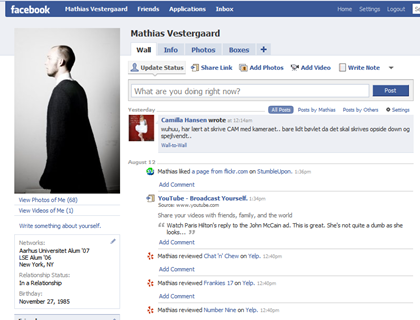 By integrating RSS-feeds, Picasa, Flickr and Yelp, Facebook is effectively making personal websites obsolete. The only real problems with Facebook are: First, that the visitor must also have a Facebook profile to take advantage of the interactional capabilities and Second, you have really no control over privacy when it comes to photos and personal information. The owners of Facebook can pull out all kinds of statistics out of their hats, to analyze mass behaviour. Additionally, it has recently been discussed how difficult it is to actually delete your personal information or your profile on Facebook. Facebook does not guarantee that your data are actually deleted, even though it is no longer publicly available. My personal (and only partial) solution to the second problem, is to inject just a minor portion of false or misleading information into the system. This will decrease the value of my personal information since it can no longer be perceived as an omnipresent truth. Visit my Facebook profile here. This entry was filed under Blog, IT - Information Technology.